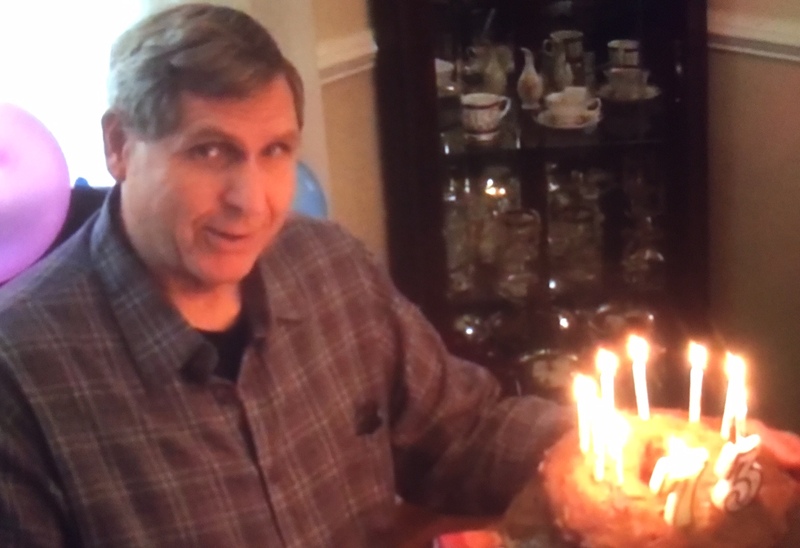 Earlier in January I baked an apple cake for my husband Cliff’s birthday celebration. All agreed it was scrumptious. However, it was my second attempt at the same recipe for reasons to be divulged in my next blog post. As they say, practice makes perfect! Matilda Butler, who earlier followed a similar plan on her website, would agree. Step 1: Make a plan. Even if you are an accomplished chef or fabulous cook (I’m neither), read the recipe carefully and anticipate how you will proceed. I didn’t have a tube-shaped bundt pan, so even before I began, I had to make a trip to the grocery store for the proper pan. Memoir Lesson 1 – Don’t fool yourself into imagining writing will be easy. Writing is certainly rewarding, but learning a new skill can be hard. I had done plenty of writing as an academic, but switching to a new genre like memoir required a totally different mindset. Even if you end up changing your plan, you have something (like starter dough!) to begin with. Step 2: Assemble what you need. Anticipate the ingredients and tools necessary. Pull out the mixer, bowls, wooden spatula, measuring cups and spoons. Take the eggs out of the refrigerator to bring to room temperature if necessary. Memoir Lesson 2 – A memoir is a slice of your life, not a biography. Ask yourself some serious questions: What part of your life will you depict – your childhood, a traumatic experience, a thrilling adventure like sailing around the world? Can you sketch out this “slice of life” in a series of memorable moments? Scribble random thoughts on colored sticky notes? Draw it as a timeline? Write an outline? What is your theme? If it’s success after a failed first marriage, that controlling idea will be the filter through which you tell your story. Flashbacks can add dimension to writing, but only if these stories connect to your theme. Step 3: Be aware that you may need to make adjustments. Even though I knew where I was headed before I began (a perfectly baked cake, I hoped!) I had to make a few changes. I ran out of clean measuring cups, so I had to wash one. A phone call interrupted the process, so I had to quickly drizzle some lemon juice onto the apples so they wouldn’t turn brown. Memoir Lesson 3 I didn’t open up the spice cabinet or pull everything down from my dry ingredients’ shelves and dump them into the batter. I had to be selective. Just so, you can’t tell every story that happened in your life. Stories have to fit your theme. Step 4: Keep at it until it’s done. I was not done with the cake until it had been iced. Preceding this was planning –> mixing –> baking –> cooling –> de-panning–> icing. Memoir Lesson 4 Memoir writing requires a series of steps to name a few: writing multiple drafts, revising, revising (Did I say revising? ), writing a book proposal, finding various types of editors and an agent, planning for publication. You can find a more complete list of steps on Laurie Buchanan’s website here. Step 5: Celebrate! Light the candles and let the birthday boy blow them out. Serve everyone else a slice. Memoir Lesson 5 Cake bakers hope the eaters will find their slice delicious. What delicious morsels of truth do you want your reader to get out of your book? That’s the memoir’s takeaway. Brooke Warner says it’s “ a gift to the reader, something heartfelt, universal, and true.” Figure out what that something special is in your memoir. As a reader and/or writer, what writing tips would you add to this list? Any cake-baking advice? Have you ever tried a baking project that turned out to be too elaborate? (Watch next post for full apple cake recipe.) Coming next: Hoorah, My 300th Blog Post with an Oops and an Aah! Next postHoorah, 300th Blog Post with an Oops and an Aah! I just read your rich post, Melodie, and will comment in a minute. Thank you for reading mine and commenting both as an excellent writer and cake baker. You are in the thick of things now with a new grand-baby and full time job. Memoir writing can wait. What a delicious post, Marian! 🙂 Happy Birthday again to Cliff! 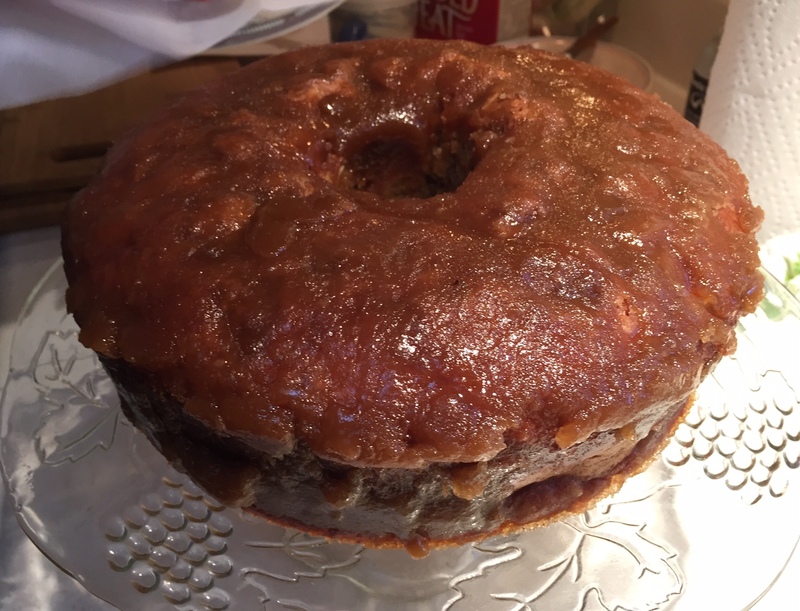 The apple cake looks so yummy, and I can’t wait to see the recipe. Planning and organizing help in both baking and writing. There are certain recipes I’ve made so often that it’s very easy for me; same thing with certain types of writing (sometimes). New recipes require several readings, although I don’t always follow them exactly. New forms of writing also require more forethought, but I might then put my own spin on them. Having done several books, I always vow that NEXT time I’ll be more organized. Let’s see what happens. Cakes are still delicious, even if they crumble, but books, not so much. Great analogy, Marian. I can underscore the point that memoir writing, especially in the long form, takes a completely different set of skills than either academic or journalistic writing. The only thing I might add to this process is to eat lots of cake along the way. One of the pleasures of learning at your own pace later in life, after tasting so many other splendid offerings. I continue to admire how you are building your knowledge and your eager audience at the same time. Obviously, the other splendid offerings of late life offer no-calorie enrichment. I can sense a renewed taste for these offerings in your writings lately. Everything you write now reminds me of Browning’s “Grow old along with me; the best is yet to be.” Thank you for such inspiration and for always encouraging me as I plod along, Shirley. These are not only steps for baking a cake and writing a memoir, but also living a life. There are many drafts in putting a life together and we revise, revise, revise. Thanks for a lovely post, Marian. You said so much in just three lines, Joan. When I read your posts, I often see strong connections between your living your life and writing a book. You have no idea how much they encourage me. I found it on Facebook, which I don’t frequent the way I used to. I will try resubscribing. I hate missing your posts. Thanks for the kind words about my connections of writing a book and living a life. The writing of the book is small compared to my life span, but it is one of the most important things I’ve ever done for myself, and takes the same kind of energy and muscle I need to live a good life. Energy and muscle – need both. Right now, I wish I could boost my energy level. Maybe lunch and a nap after a morning of pushing up the hill . . . ! I can’t wait to read your book, Joan. What a great analogy! I enjoy baking but have occasionally taken on something too complicated (much like writing). I guess you could add: don´t get discouraged and if you have to throw it away and start over, it´s OK. I am sure Cliff appreciated your effort and had a great birthday!! Happy belated birthday to Mr.B. Thank you, Darlene. I will mention your good wishes to Cliff. At our age, birthday celebrations should go on for weeks, not just a day. Oh, I hope I don’t have to “throw it away” although that’s an option if the writing gets too bogged down. I’m guessing you also get discouraged sometimes “but pick yourself up, dust yourself off, and start all over again.” Thanks for the empathy, Darlene. Happy writing! We lived in a travel trailer for over a year with hubby and two children and remember the cramped space. However, I have seen a photo of your motor home, perfect for just the two of you. Now I’ll imagine your making this cake “on the move.” I appreciate your frequent stops here. Thank you, Fatima. Again another wonderful post. As for baking I can’t follow a recipe it never comes out right but when I throw it together and mix it turns out great. As for writing it has never been a joy for me. I’ve always had an assistant to do all my paper work. How I miss them. I’m always being told I should write a book. Now that I saw this post I might get to courage. Wheaten College does a writers workshop in the spring will look into it. Thank you for waking up that side in me. By all means, sign up for that writers’ course at Wheaton. You have absolutely fabulous stories that beg to be told. Not all people with great stories need to be published authors, but now you feel the urge to write, a sign you should probably move ahead with pursuing your dream. Since I began my memoir, I have taken two writing courses, both of which helped me in different ways. Thanks for adding to the conversation here, Gloria. The tale of my cake mistake comes in next week’s post, Jenn. I’m glad you enjoyed the analogy – writing and baking, both creative acts often with unanticipated results. Actually, the idea had sprung from another writer’s blog, Matilda Butler, to whom I have given credit in the first paragraph. But thanks for the compliment anyway. My piece is a whole lot shorter and my cake much less elaborate. She baked a 4-layer, chocolate and vanilla birthday cake. You may want to check hers out. As a matter of fact, I’ve seen several of your “tasty” cakes on your blog as your honor your family too. Elfrieda, it occurs to me that you could write a memoir with recipes as an anchor point. Bake some recipes into your writer’s batter. Recipes don’t always have to appear in the appendix. Your Amish quote is both wise and comforting – thank you! Well, the delicious slice of life yields both sweet and sour, as well you know. How wonderful to have the camaraderie of writer friends like you to share the journey. Thank you, Kathy! Before he could dive into the cake, he had to blow out the candles, which proved to be challenging because he ran out of puff, struggling with the very last candle. One of our kids snapped a time-lapse video of him in the process with hilarious results. You are kind to comment – thank you, Jill. Oh, I remember the Robert Fulghum book, even used some of his anecdotes in my composition classes. Remember the one about the guy who faked knowing how to use a jumper cables – ha! Thank you for drawing the multi-tasking comparison. I hadn’t thought of that, Marylin. Hi Marian: I am flattered that you mention my blog about the comparison between baking a cake (a ridiculous four-layer cake) and writing a memoir. Many thanks. But I am especially happy that it provided a seed for this great post you wrote. I agree with all of your points and you’ve contributed to the discussion. And what a lucky husband. The cake looks fabulous (as does Cliff). The time-lapse video of the candle-blowing ceremony must be priceless. Congrats on a great post. And with your permission, I’ll link to it from my blog. Permission granted. I’m the one who’s flattered, Matilda. I agree – it’s great when one idea sparks another in the blog writing world. Thanks too for commenting here! Love the way you draw parallels between baking and writing! I think we both try to harness the power of metaphor and drawing analogies in our blog posts. You do it with Mother Nature all the time on your website – always a feast for the eyes. It will be a ping to look forward to. Thanks again, Debby. This is fun, Marian. And true. I’m no longer a baker and cook simply other than for holidays, but I get this. Despite our best intentions, cooking and memoir writing are both alchemical with uncontrollable transformations involved mixed with a dash of experimentation. Cooking nurtures the body and memoir writing feeds the soul. The end product may not turn out the way I imagine. Maybe better. Maybe worse. Main thing is to keep experimenting. Great photos, as always. Today was the better tale, next week comes the worse. You got it exactly: Cooking nurtures the body and memoir writing feeds the soul. I may be repeating myself in an earlier comment to you, but Louise de Salvo (The Art of Slow Writing & Crazy in the Kitchen) insists that she couldn’t write without creating in the kitchen. I have to say that sometimes I’d love to have meals magically appear, especially when I’m in writing mode, like now. Maybe you agree. Oh dear. I think I’m lost already. My writing is very haphazard, just the things that come to mind really. Maybe I should make a plan? I don’t think strict rules apply to everybody. Your writing follows a readable sequence, even if you don’t plan. As I think of your blog posts, I wonder if you don’t see pictures unfolding in your mind as you write. It is pretty much like that. Sometimes a snippet of something comes to me and I sit and see it. Perhaps it’s because I studied art, I’m a very visual person. I don’t write, other than letters and a journal. I very much enjoy reading. I am glad your cake baking was successful. Many happy returns on your husband’s birthday and many more. 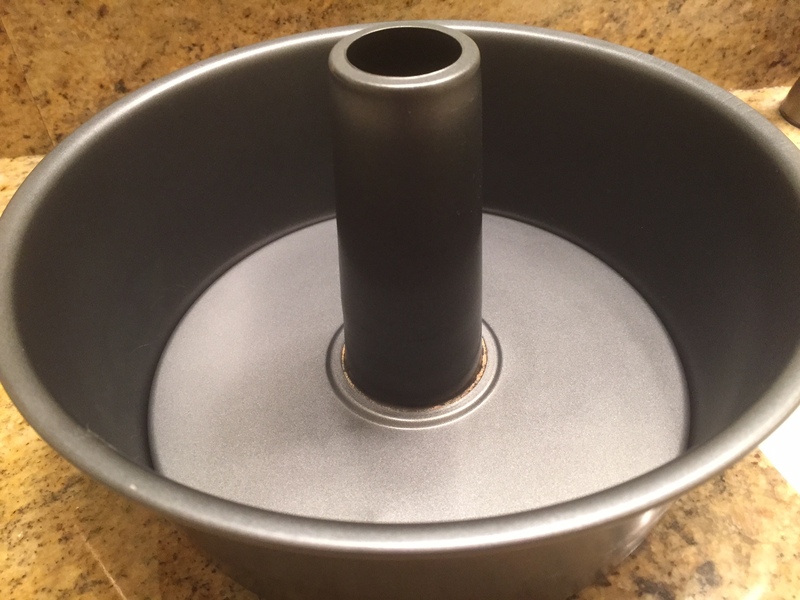 I hope you find all kinds of new cake recipes to use with your tube pan. I have not found a recipe too difficult, as of yet. I like to bake. It’s always important to read the recipe more than once, organize, assemble. I know you like to bake, but I also think you are a writer. In our very first line I see that you write letters and journal. As I write my memoir, letters from my Grandma and Mother have filled in some gaps. If I had their journals, I’d know even more. In other words, your journal is a treasure. Keep on with that, Athanasia. And thanks for making a connection here again. Is anything we do , in life that is worthwhile , easy,..nothing . At times we even have to think to breathe . .. But we know life is sure worth it . I am writing a memoire, like you , at the moment . Some days I find a voice sometimes the voice gets lost and I have to hunt for it . You never have to apologize for being late, Cherry, especially with good reason – no internet. I can relate to the hunting for a voice. However, I detect your distinctive voice in everything you write here. That’s what sets your writing apart from others. About the rock cakes – is there really a recipe for such a cake, or did your baking simply turn out “hard”? Just curious . . .
Great advice! I enjoyed this very much. Hi, Arlene. I remember you from your commenting on one of my “snowy” posts. I’m glad you enjoyed this one too and hope you and your family are keeping warm in Ottawa. Thanks again for visiting today. I enjoyed the post and especially being able to actually taste the cake you made. Sometimes when watching (not often) a cooking show I wish that a tray would slide out beneath the TV with the cook’s just completed tantalizing recipe! Sort of like virtual-tasting. Clever idea – cooking shows with TV tray slide-outs. It sounds impossible, but one never knows. I’m glad this cake was finally a success. Any way you slice it, Marian, I think you have the ingredients for an excellent apple cake and delicious memoir. Best wishes to you. You’ve made many excellent points. Judging from all your writings, I’d say you have a built-in GPS. But, if you are like me, you’ll need some time to transition and let the dust settle after a busy career like you’ve had before you tackle memoir. By the way, there can be more than one theme. I am always amazed at your creativity in choosing stories. Your years in journalism have given you an edge there no doubt. As always, thanks for stopping by to read and comment, Judy. Welcome, my friend. I believe I know you (well, sort of) having seen your Gravatar photo and comments on other blogs. Like you, I am addicted to reading & writing and all the fabulous connections that result. Do visit again. And thank you for the cheer here! What a delightful analogy, Marian. Cakes might seem easy to make but they can turn out flat and put too much sugar in it and it’s too syrupy. Now, what could be better than reading a good memoir with a cup of tea and a slice (or two) of moist chocolate layered cake! 🙂 . I like the idea: Food for the body and soul! Thanks for commenting here and on Debby’s re-blog – both appreciated! Excellent analogy. The good news about writing is, unlike a cake, you do get multiple tries. Once you put the cake into the over to bake, that’s pretty much your last shot. With e-publishing, the ability to improve is infinite! You are so right. We don’t “publish” cakes, but there is no revision if baking soda or (like me, 1/2 box of mix) is left out. I’m currently in the muddy middle, in revision-land. You do know, of course, what that feels like. Thanks for adding your wisdom to the conversation including the benefits of e-publishing, Debby. Good luck in revision land. Hope you’re through it soon! Oh I feel sure you’ll get there. Enjoy the ride in the meantime. Sherri, you are making footprints ahead of me on the writerly path especially the idea of letting ideas simmer, marinate. When I measured out this advice, I was thinking of myself as much as admonishing readers who write. Congratulations on your progress. (Don’t we need to hear this more often?) Right now I’m pondering how I can re-visit a major theme in a scene near the end, one that appears 3-4 times throughout the draft.